The pool is a fun and motivating place for many children and playing in the water can also be a place for learning. Together we create opportunities for communication and interaction through singing, movement and play, while increasing body awareness and coordination. Getting out to the pool also provides opportunities for children to learn to do things by themselves. Each child must be accompanied by an adult in the pool. You are welcome to bring along another adult if you have more than one child. This is not a ‘learn to swim’ class. 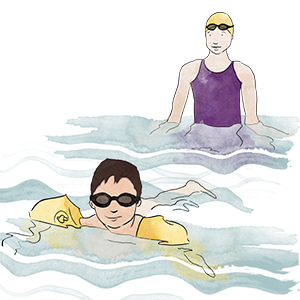 If you are looking for swimming lessons we are happy to assist with information.